On Jan. 30, 1972, British troops opened fire during an unauthorized march in the Bogside, a nationalist area of Londonderry. They killed 13 people and wounded 14 others, one of whom died later. The victims were all unarmed Catholics. One former soldier, identified as Soldier F, was one of 17 former members of the 1st Battalion Parachute Regiment whose actions in Londonderry were being considered for criminal charges. 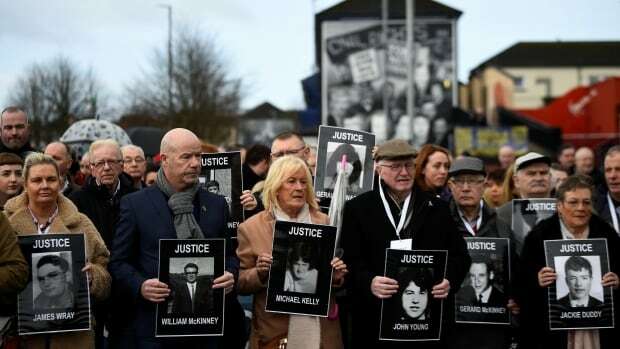 He is to be charged with two murders and four attempted murders during Bloody Sunday, the event that is the focus of the U2 song Sunday Bloody Sunday. The Public Prosecution Service of Northern Ireland said on Thursday there was enough evidence to prosecute Soldier F in the deaths of James Wray and William McKinney. The soldier will also face charges for the attempted murders of Joseph Friel, Michael Quinn, Joe Mahon and Patrick O’Donnell. The PPS said there was insufficient evidence to prosecute 16 other soldiers and two official IRA men. One other soldier involved has since died. The Widgery Tribunal, held in the immediate aftermath of the incident, largely cleared the soldiers of blame. But a second, 12-year investigation known as the Saville inquiry found they did not act in self-defence and there was no justification for the killings of 13 unarmed demonstrators protesting Britain’s detention of suspected Irish nationalists. “None of the casualties was posing a threat of causing death or serious injury, or indeed was doing anything else that could on any view justify their shooting,” the report said. But the results of the Saville inquiry, which concluded in 2010, could not be used in any prosecution, and Thursday’s charges resulted from a separate police investigation into the incident. “Much of the material which was available for consideration by the inquiry is not admissible in criminal proceedings due to strict rules of evidence that apply,” Stephen Herron, director of public prosecutions for Northern Ireland, said as he announced the charges. The decision not to prosecute other individuals, he said, “in no way diminishes” any of the findings of the inquiry. “We recognize the deep disappointment felt by many of those we met with today,” he said. Victims’ families said they were disappointed by the decision. Their lawyers said they would challenge in the High Court any prosecutorial decision that did not withstand scrutiny. Geraldine Doherty, a relative of Bloody Sunday victim Gerald Donaghy, said the prosecution was 47 years overdue and did not go far enough. Supporters of the soldiers say it is unfair for them to face charges decades after the events. Britain’s defence minister, Gavin Williamson, said the government will provide legal support to the soldier. “The welfare of our former service personnel is of the utmost importance and we will offer full legal and pastoral support to the individual affected by today’s decision,” Williamson said in a statement on Thursday. The 1998 Good Friday Agreement brought a close to Northern Ireland’s 30-year sectarian conflict in which about 3,500 people were killed. British troops subsequently withdrew from the province, but tensions still persist.